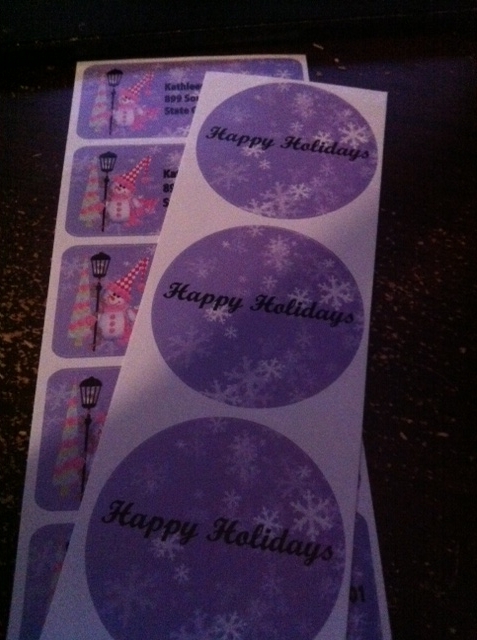 Lovable Labels Holiday Gift Seals and Return Address Labels Review! One of the things I HATE to do most is writing my return address on letters and bills. So I tend to always use return address labels. It saves me time and I love all the different designs that are out from various sources. I recently had the chance to review a Gift Seal and Return Address Label package from Lovable Labels. It all started with a mom who was frustrated by having to label all of her childs items at her childcare facility. From shoes, to outdoor clothing to sippy cups, she recognized the need for personalized labels that were tough and durable and could stand the test of time and the everyday use that children put them through. Lovable Labels was launched in 2003. Personalized durable labels and tags are their specialty. Their labels are waterproof, dishwasher safe, microwave safe, washer and dryer safe, sun safe, bleach safe, sunscreen safe and temperature safe! I love the gift seals and return address labels that I received. I chose the SNO Berries design because I love purple. I have been using the address labels on my Christmas cards and other mail that I have been sending out. I love the ease of use as you just peel, stick and you're done. I have been using the gift seals on the back of my personal letters and Christmas cards as well. It's an extra touch and looks so professional. The quality of both the gift seals and address labels are fabulous. They are not flimsy at all. If you are using the labels on letters, they won't get ruined by rain or snow. I am thoroughly impressed by the quality and design of these labels and wouldn't hesitate for a minute to order more of Lovable Labels products in the future. Stay tuned because on 11/27, during the Winner Wonderland Giveaway Hop Event, you will have your own chance to win the Gift Seals and Return Address Labels package that I received. You will be able to personalize it to your needs and wants. Disclosure: I received complementary samples in order to facilitate a review. No other compensation was received and all opinions are honest and my own. Thank you for your review on our Gift Seals and Return Address Labels. Glad you loved the quality of both of them and you enjoyed labelling all your mail in a chic way! P.S. I love going shopping in PA! It's awesome and I can see why you would enjoy it as well. Talk to you soon.